Let’s All Die Happy has a frenemy in the band Rush. The speaker shows great determination in learning how to roll her jeans tightly at the bottom and saving change in a coffee can. While she practices disappearing, she also sees all manner of possibility in a road trip or a cheerleading squad. In the poem “I Would Have Listened to Rush,” the speaker will not be deterred by shipwreck, wild animals, book-burning, starvation, exile, amputation, or animal entrails. This implies that the speaker drew the line at Canadian heavy metal yet would have gone so far as to listen to the band to express her love for a certain young man with a “lazy eye.” Rush, with all the electrifying rifts and elongated guitar solos, could be her frenemy and perhaps “Tom Sawyer” her theme song. If this book were a toy, it would be a Yo-yo, or a boomerang, whirling forward and backward in space. 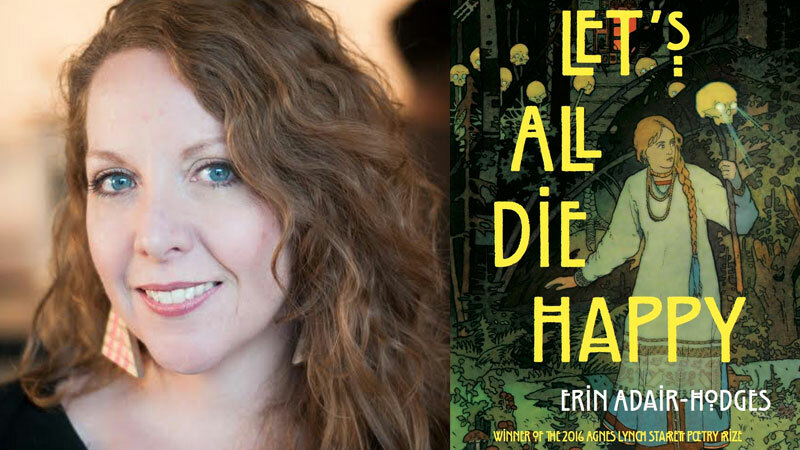 Let’s All Die Happy begins with an adult speaker who traces back memories of youth and childhood before reentering adulthood through the perilous path of dating and wedding vows, from childbirth through mammograms. The poems reach a point of liberation in the final section where the speaker finds a selfhood free from the gravity of time. If this poetry collection took the form of a landscape, it would look like Valencia County, New Mexico. The poem “Girl, Know Your History.” leads with the epigraph “Belen, New Mexico,” known as Hub City because of its central geographical situation in the state. Belen, Spanish for Bethlehem, has several references in Let’s All Die Happy, as does Los Lunas, the county seat of Valencia County, a village that takes its name from the moon. Throughout the book, kids chase alley cats. They trail dirt, dust, and grit onto apartment floors to be broom-swept outside and tracked in again after a trip to the local grocery. A community college presents their educational aspiration and those of their parents in Valencia County. The desert landscape forms a backdrop for almost each poem. a lung with nothing to do. Leah Miranda Hughes is a pacific poet and professor who lives and writes in Atlanta, GA. She gets paid for curriculum and sells her soul for poetry. She also runs a tutoring business, The Study-O, where her students get into the college of their choice with scholarship money. Her poems appear in Glass, Mylexia, Aquillrelle, and Ray’s Road Review.